Diner, Atlanta GA (CLOSED) – Marie, Let's Eat! I’d like to think that I’m a pretty patient fellow, but nothing’s worse than waiting and waiting for a restaurant to open, in part because we tend to wait a couple of months to give the management and staff time to work out the kinks before we visit a new place. 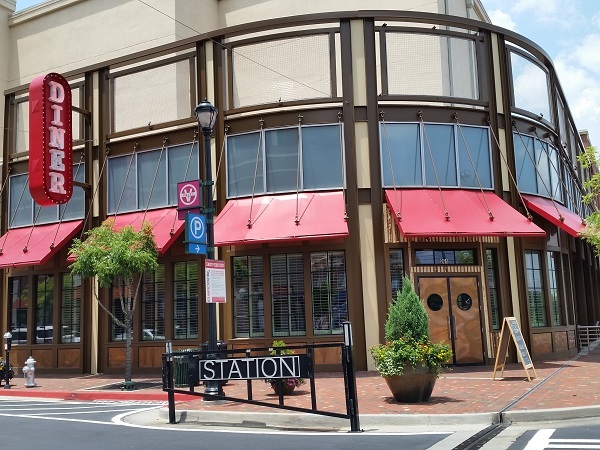 We’re not in Atlantic Station very often, but Ron Eyester’s latest restaurant, called simply Diner, sat so enticingly for so long. I enjoy Eyester’s work a whole lot, and he’s often very funny on Twitter (a plus), so when the stars lined up just right, I was so glad to stop by. Now, sure, we’ve got a few diners in town already – although nowhere near as many as they do in the northeast – but by and large, these aren’t known for made-to-order cooking using sustainable ingredients from local providers. Diner gets ice cream from the local boys at High Road Craft, for example. The result is a menu that’s certainly not as dense as the gigantic books that you get at Landmark or Marietta, but I still had a hard time deciding what I wanted on my first visit. Everything sounded really good. 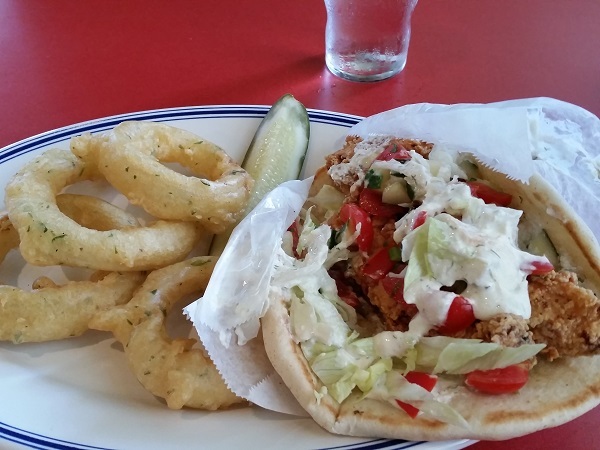 I settled on the fried chicken gyro, which has tenders with a tomato-cucumber salad, shredded lettuce, and a tzatziki sauce and I really enjoyed it. I happily paid the extra fifty cents to have some onion rings instead of fries, and totally loved that incredibly sharp and wonderful pickle. Everything tasted so fresh. Having said that, I looked around for something else to say and realized that I needed to sample a little more than that. As I have said before, I don’t mind writing about a place after just one meal because I don’t consider myself in the business of “restaurant reviews,” but rather telling stories, and Diner absolutely felt like a place that had much more to share than what you could get with a single meal. So, a couple of weeks later, I went back for seconds. On my second trip, I arrived hot, overheated, sweating, and downright worn out. We’d been working outside in the ninety-six degree sun over at my place of business, getting ready for a huge project. One of the adorable little design elements suddenly struck me: Eyester had selected some absolutely perfectly-sized glasses. While what I really wanted was the biggest cup of water in the world – one of those 64-ounce Big Gulp things, you know – the tables have these dainty little eight-ounce glasses like your grandmother had, or, you know, a northeastern diner. I drained the tiny thing of water and ice in one swallow, and asked to keep it coming. Since, as before, it was pretty slow inside – I wasn’t expecting it to be too busy at 2 in the afternoon but it really was pretty quiet – the service was quite attentive. 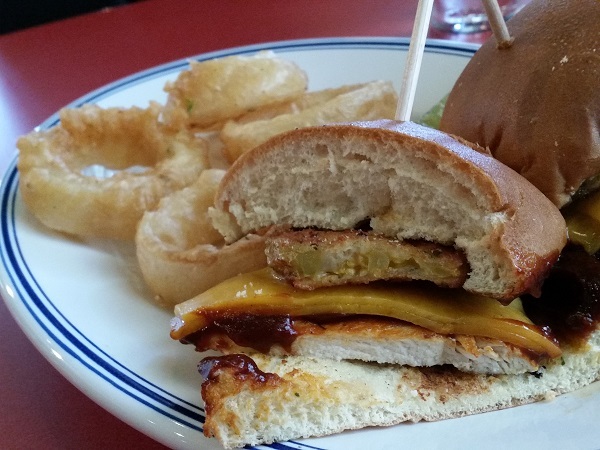 This time, I ordered the barbecue chicken sandwich, a boneless patty with cheese, fried green tomatoes, and a sticky sweet brown sauce like you might find in Memphis. It was a good sandwich; to be fair, I honestly don’t think that it’s as good as the chicken sandwich down the street at Chick-a-Biddy, and I preferred the gyro from my first visit, but it was still a fine lunch, and I loved the onion rings and pickle again. Diner isn’t doing anything mind-blowing, but I left satisfied and pleased on both visits. Some vultures have been circling online, saying that business is even slower than I observed (Wyatt Williams of the AJC was particularly harsh in his review), but I do plan to be back. Posted on August 9, 2015 August 23, 2017 by Grant G.Posted in atlanta, casual american, chicken, georgiaTagged atlanta, atlantic station, chicken, diners, georgia, midtown, ron eyester. It is always nice to see a new diner in town but, I love how you reviewed after a second visit, and gave everyone an entire perspective that is real. Looking forward to going there myself because as a Northerner diners are a form of excitement for me. Thanks for taking the time out to do this, and share your experiences. Thanks for writing! I hope you enjoy it when you visit. We’ve been once and you could have shot a 410 and not hit a soul inside, although there were people on the patio. We plan to go back, but I enjoy Rosebud so much, it fills my Eyester cravings. He does kill me on Twitter, though. I hope that it’s busier in the evenings, with movie theater guests! I just moved from AS after 3 years. I went into Diner when they first opened but it was only a limited menu so based on this review I need to go back. I did finally make it to Rosebud for lunch! Rosebud’s been calling out for a visit from us for… well, a really long time. We need to get over that way again soon. Thanks for writing! Unsurprisingly but unfortunately, Diner closed in February 2016.